Since Nicolas Cage became a one-man-meme generator a couple of years back, a notion has grown in the public consensus that the man simply can�t act very well or according to the designated character. Of course, this idea elegantly ignores films like Vampire's Kiss, Wild at Heart, Raising Arizona, Guarding Tess, Leaving Las Vegas and Adaptation. Yes, it�s true that his choice of films in the 21st century wasn�t exactly stellar (Bangkok Dangerous, for example) and his manic energy often comes out in sublimely weird ways, but essentially, in my opinion, Cage has absolutely nothing to prove anymore. Now, he obviously works using the Michael Cain rule of accepting all that is offered to him in his price range and Pay the Ghost is strangely one of the best films he participated in over the last few years. But, this is more about his low artistic standards than the quality of this movie because this film is an average medium-budget horror which provides one or two interesting visual moments, but the rest is located in its entirety VOD territory; indeed, I bet many will watch Pay to Ghost on line primarily, instead of going to a theater. In the story, Cage plays a college professor whose son disappears one Halloweens night. A year later, he is adamant about finding him, especially because he is certain that paranormal things were somehow involved. The director of the film, Uli Edel, brought very little of his sharp German-style cinematography, like the one we saw in The Baader Meinhof Complex, and instead drowned the film in general New York locations and settings. The same is true for the film�s horror moments, which generate tension, but do it with without much tact or grace. 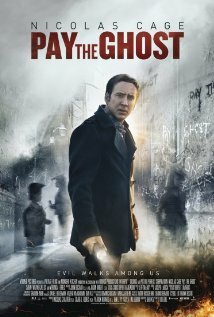 Similar to the story of the thriller Before I Go to Sleep, Pay the Ghost has it all from a narrative standpoint but lacks that spark that can really animate the story in a more engaging emotional way. But, when it is compared to a regular, run-of-the-mill horror, watching Pay the Ghost movie is a pleasant experience, with much unwanted distractions or annoyances. I�m sure that Uli Edel can create a lot better horror films than this one and I would even like to see Cage act in them in the future.